A Siberian husky named Mya and Sitka was at the center of an ongoing custody dispute between her current and former owner. STEAMBOAT SPRINGS — A Siberian husky at the center of a fierce custody dispute won’t be coming back to Steamboat Springs. At the conclusion of another tense court battle at the Routt County Justice Center on Friday, Judge James Garrecht upheld his previous ruling that the dog will stay with her first owner on a ranch in Cañon City. 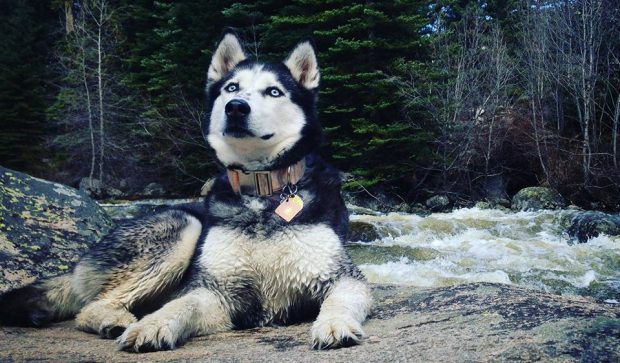 Garrecht expressed sympathy for Ashlee Anderson, the Steamboat woman who cared for the dog for more than four years until it was discovered the husky had a previous owner on the Front Range. Under Colorado law, dogs are treated as property, and the best interests of the dog are not taken into account if a previous owner can prove ownership. The dog, known to Anderson as Sitka and her previous owner as Mya, was returned to Michael Gehrke in Cañon City last month. After Friday’s court proceedings, Gehrke pulled out his phone to show a video of Mya’s homecoming. In another video Gehrke showed, the husky answered his calls and was seen rolling around in a small irrigation pond. The dog’s fate was only a piece of Friday’s legal proceedings, which were marked by tense exchanges between Gehrke’s and Anderson’s legal teams. Judge Garrecht had to bring order back to the proceedings at times. Anderson’s legal team accused Gehrke of libel and slander and alleged he had wrongfully labeled Anderson a thief in media interviews and in posts on his personal Facebook page. Anderson’s attorneys argued she had lost business as a result of the posts. But Garrecht dismissed those complaints after it was determined Anderson’s attorneys had not properly filed evidence of any defamatory statements before the trial. There was a brief pause in the proceedings when Garrecht said he was not familiar with Facebook and needed to do some research. “I don’t know squat about Facebook,” the judge said. The judge did note that Anderson did not steal the dog from Gehrke, but rather became a good caretaker of the animal after the dog left Gehrke’s property. The dog reportedly came into the possession of a homeless man before she was adopted by Anderson. Anderson’s attorneys also argued Gehrke should be liable for the more than $15,000 costs that Anderson incurred taking care of the husky and saving her life when she was found in poor health. Garrecht did not agree with that argument, either. “I call it a wash,” he said at the conclusion of the trial. The legal drama between Anderson and Gehrke may not be over yet, however. In his ruling, Garrecht said each side should be responsible for their own legal expenses. Gehrke’s attorneys said they will likely appeal that decision and seek legal expenses from Anderson. “We think Dr. Gehrke should have gotten this dog back a long time ago,” his attorney, Jennifer Edwards, said at the conclusion of the trial. Anderson’s attorney Emily Kelley said she was sad her client would not get to keep the dog that had become a part of her family. Kelley predicted the laws could change in the future so the best interest of a pet can be taken into account in cases like the one focusing on the husky. “This is the future of animal law,” she said.